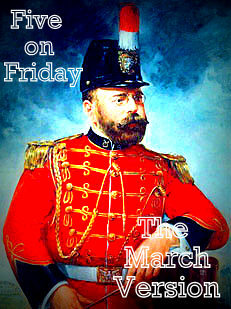 For this first Friday in March's version of Five on Friday - a musical meme hosted by Travis of Trav's Thoughts - I decided to pick five of my favorite marches by the legendary composer and conductor known as the American March King. Beginning in 1917 until his death in 1932, John Philip Sousa wrote 136 marches so picking just five was kinda tricky - especially considering I've always quite loved march music. There's just something about watching a marching band in a parade playing a fine bit of music as they go by that puts a lump in my throat and a tear in my eye every single time; that's either a result of my military upbringing or the fact that I'm a total sap! Anyhow, I started out this week's set with a video that I took back in June of 2008 when Amanda was still attending Norwich Free Academy and played in the band there. I never could talk her into joining the marching band but she was in concert band for two years and I proudly and happily attended all of her concerts including this one where they performed Sousa's "El Capitan". If you look closely, you can just make out her blue hair in the second row among the other flutists. And yea, I know that her band director is glowing in the video but Mr. Mac wore a bright white jacket and the lights reflecting on it made him even brighter! Not that I had the greatest video camera in the world either but ah well at least I had one! As for the other marches I've included, they're among my other Sousa favorites, especially "King Cotton" which always reminds me of riding on a carousel and "The Liberty Bell" which reminds me of watching "Monty Python" on PBS when I was in high school. "The Washington Post" was written in 1889 for the awards ceremony for the newspaper's essay contest and is considered one of Sousa's most popular marches and certainly no set of favorite Sousa marches could be complete without "Stars and Stripes Forever" - at least not my set of marches! After all, it is the National March of the United States! Even though it's not a Sousa march, as an added bonus I just have to include "Seventy-Six Trombones" which is the signature song from The Music Man by Meredith Wilson. A lot of people think this is another Sousa march as it sure sounds like one of his but that's simply because Wilson was a member of Sousa's band as a flute and piccolo player from 1921 to 1923. Personally I think it's a pretty nice tribute from one composer to another! Way cool Linda. Real toe tappers each and every one. While not historically accurate, one of my favorite movies is Clifton Webb as Souza in "Stars and Stripes Forever". Every once in a while around our house we will get into the spirit with Name of a composition "song Dixie" name of composition "song Dixie" name of composition "song Dixie" as a great movie reference. Wilson actually mentions Souza's name in the verbal lead in to 76 Trombones. "Gilmore, Pat Conway, The Great Creatore, W.C. Handy, and John Philip Sousa all came to town on the very same historic day." I really love a good march, and Souza was one of the best. What a great theme for the first Friday in March! Now, I have 76 Trombones stuck in my head. I've had worse. I'm also a sucker for marching bands. Performing in the Nova Scotia military tattoo twice was a huge highlight for me. It's a British march, but as a former colony, Canada also claims it as our official navy march. I LOVE, love, love Hearts of Oak. And as lifelong fans of Monty Python, your Liberty Bell choice this week had great grins spreading across my husband's and my face. John Philip Sousa performed at the Sterling Opera House! I enjoy marching music as well..I listened to Norwich Free Academy's performance. Didn't see Amanda though. I'll have to come back and listen to the others. I'm laughing at Dianne saying she is a closet band geek. And you, a sap?? Nah.